Designed your own post card?? As long as the file is compatable, the price below is the price you will pay, no setups, design or other charges! 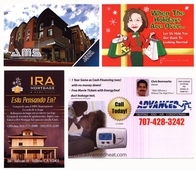 We usually provide 2-3 day service on digital post cards. We can do post cards in almost any size. Please contact us with your job specifics and we will provide a quote. These extremely high quality rack cards take approximately 2 weeks to produce.